Let's face it, public clouds are complex, and the available options and complexity are growing at a rapid pace as the cloud providers continuously release new configurations. Currently, when deploying a workload on a public cloud IaaS layer, a customer cloud operations team is faced with millions of configuration options on IaaS only. A recent example is AWS’ New AMD EPYC-Powered EC2 M5ad and R5ad Instances which were released on March 27, 2019. These instances are variants of the M5 and R5 EC2 Instance families, they are using custom AMD chipset (AMD EPYC 7000-Series at 2.5 GHz), built on AWS Nitro System and they are currently priced approximately 10% lower than comparable M5 and R5 instances. The new instances were released in 6 different sizes each, from large to 24xlarge, offering different vCPU, RAM, Local Storage (NVMe SSD), EBS-Optimized Bandwidth and Network Bandwidth capacity. In my blog post from January 2019, I shared my thesis on why "Cloud Cost Optimization is Beyond Human Scale", and the ever-growing configuration options are making it impossible to keep track of and truly understand their capacity, their costs, and how to match an application demand to them. If you are a Turbonomic customer, you have nothing to worry about. Turbonomic’s got you covered automatically and autonomously. Since Turbonomic automatically becomes aware of new instance types through the cloud provider API, new instances will be automatically considered for any workloads running in the regions where the new types are available (as of March 31, M5ad and R5ad instances are available in the US East (N. Virginia), US West (Oregon), US East (Ohio), and Asia Pacific (Singapore) Regions in On-Demand, Spot, and Reserved Instances). In the above example, Turbonomic has identified an instance that could save $0.055 /h if it will be sized to r5ad.large from t2.xlarge. Note that the instance will benefit from additional CPU speed…yes, more CPU at a lower cost! 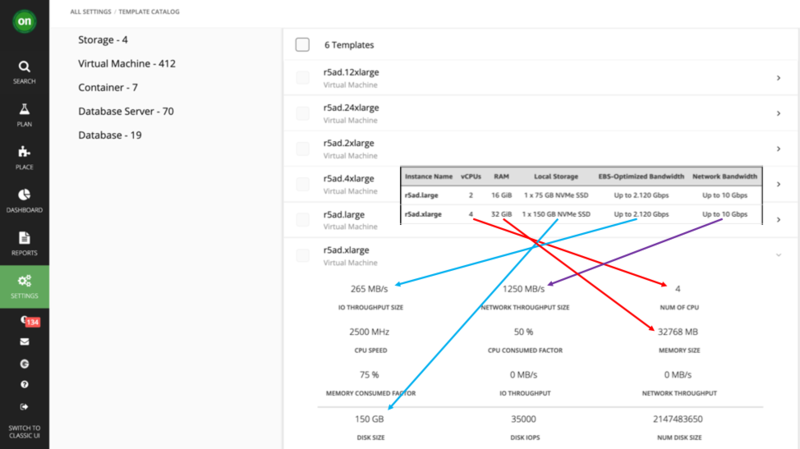 It is important to note that this scale action is blocked from execution, because Turbonomic knows that the new R5ad family requires NVMe drivers to function and the instance is not configured for it. Once the operator updates the instance to enable NVMe, the action will be cleared. This is why enterprises globally trust Turbonomic’s actions, you can’t get better than this. Turbonomic does it at scale on thousands of instances simultaneously so IT staff can spend their time on higher value projects rather than guessing about cloud instances! Highly performing applications at the lowest cost possible – this can only be done by a platform that automatically discovers and understands millions of cloud configuration options and able to match them to the application demand, at scale and in real-time! Improving Cloud Operations Staff productivity - Cloud Architects can focus on designing highly-available applications and less on keeping pace with the new cloud configuration SKUs. Turbonomic will take care of performance, policy compliance and cost, automatically! A single platform to control Hybrid, Multicloud and Multiplatform targets – even though the example was focused on AWS, the same applies to Microsoft Azure, IaaS and PaaS, VMs and Containers, On-Premises and Cloud. This is the Turbonomic difference!